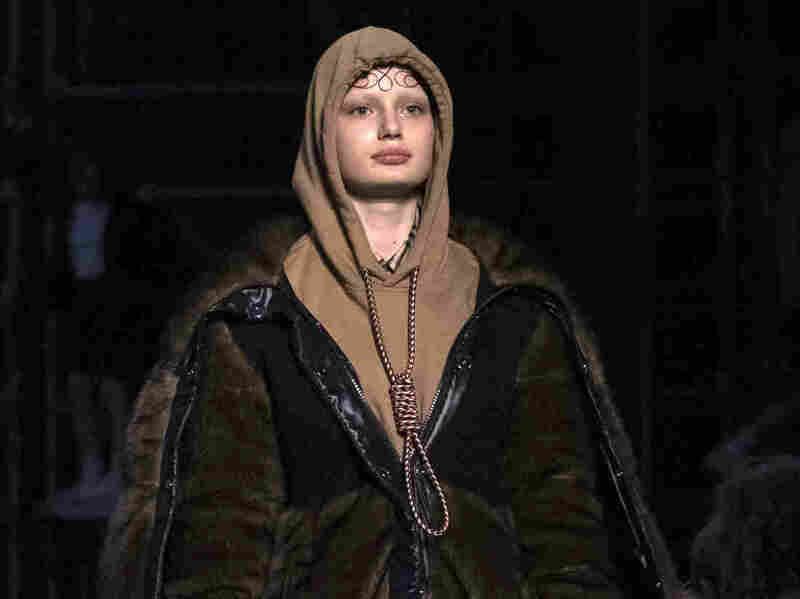 Burberry Apologizes For Nooselike Knot On Fashion Hoodie A runway model who objected to the impression made by the drawstring says she was initially told to "keep it to yourself." A Burberry model wearing a hoodie with a cord tied like a noose at the Autumn/Winter 2019 fashion week runway show in London. Company leaders have apologized for the garment. The top officers of the fashion giant Burberry are apologizing for clothing a model in a hoodie with a cord knotted in the shape of a noose at the company's London Fashion Week show on Sunday. Initial reaction against the hoodie and nooselike drawstring came from one of the company's own models. Burberry has dropped the item from its collection. "We are deeply sorry for the distress caused by one of the products ... featured in our A/W 2019 runway collection Tempest," Burberry CEO Marco Gobbetti said in an emailed statement. "Though the design was inspired by the marine theme that ran throughout the collection, it was insensitive and we made a mistake." Burberry's creative director, Riccardo Tisci, also apologized. "While the design was inspired by a nautical theme, I realise that it was insensitive. It was never my intention to upset anyone. It does not reflect my values nor Burberry's and we have removed it from the collection," he said. Their apologies came after a backlash beginning with model Liz Kennedy, who posted her objection on Instagram. She was not the model who wore the outfit. "Suicide is not fashion," Kennedy wrote. "It is not glamorous nor edgy and since this show is dedicated to the youth expressing their voice, here I go. Riccardo Tisci and everyone at Burberry it is beyond me how you could let a look resembling a noose hanging from a neck out on the runway." She blamed the company's leadership with ignoring "impressionable youth," adding, "let's not forget about the horrifying history of lynching either." Kennedy also made it clear that she was "extremely triggered" by the hoodie and noose for personal reasons. "Feeling as though I was right back where I was when I was going through an experience with suicide in my family," she added. Kennedy wrote that when she asked to speak to somebody about the outfit she was told to write a letter and that "nobody cares about what's going on in your personal life so just keep it to yourself." In his statement, Gobbetti said that he called Kennedy to apologize to her. Burberry is the most recent company to come under fire for fashion missteps. Last week Gucci withdrew a sweater with an oversized collar critics likened to a blackface image. Late last year Prada dropped a line of merchandise resembling monkeys with black faces and red lips.